A long-time Paris resident recently wrote to me: I always try to encourage my friends to go off of the beaten path – see some new areas – which they Never Do. 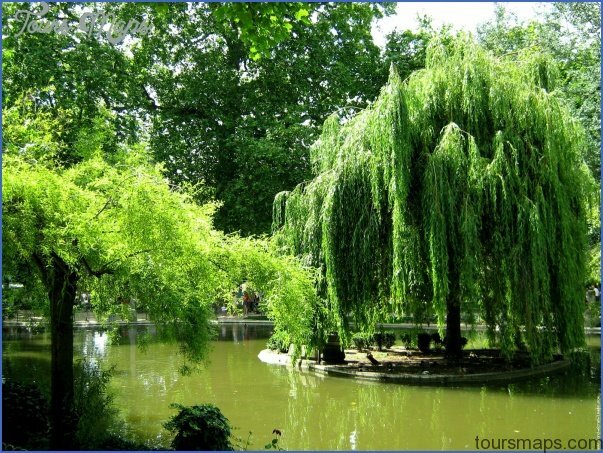 Of all of the people I know who often go to Paris, not One has ever been to Les Buttes Chaumont for example. Most just stay in expensive hotels, eat in expensive restaurants, go to the big-name exhibits and shop til they drop. There are so many interesting neighborhoods off the beaten path but that does not interest them That’s too bad, I guess it’s just me. If you find that this observation rings true, even just a bit, then read on. 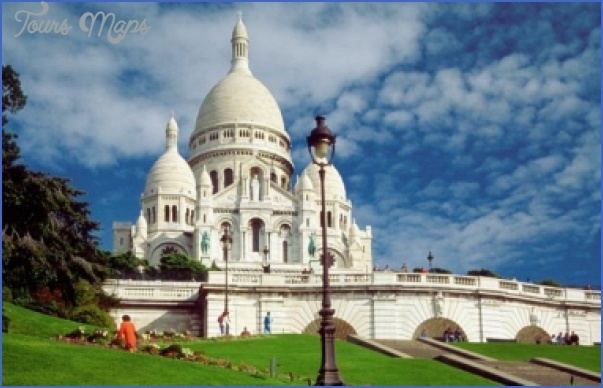 The word butte means a hill, and in Paris there are quite a few neighborhoods or quartiers built on hills. 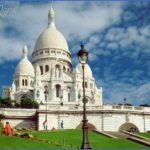 The most well-known is La Butte Montmartre, and I’m not going to talk about that as it is treated in virtually every tour guide, except to say see my suggested tip under Cemeteries (n°10) and Fabric (n°18). The following are places that Parisians highly recommend. Chinatown (see n°12) and the Place d’Italie. It is a charming village that contrasts with the dreary and unaesthetic apartment towers that surround it. Originally a workers’ village, it has been gentrified but the charm remains. I suggest a meal at Chez Yong, 72, rue de la Colonie, Paris 13 (Tel : +33 (0)1 45 65 17 88) Metro : Maison Blanche or Tolbiac (Line 7), Tramway Poterne des Peupliers station. We celebrated the Chinese New Year here several years ago with my calligraphy class. Most of the patrons are local Chinese residents and this is a great find if you want to eat a genuine Chinese meal at a very reasonable price in a picturesque neighborhood. My friend Barbara and her companion Christian suggest stopping for lunch at Le Temps des Cerises, 18-20 rue de la Butte-aux-Cailles, Paris 13 (Tel: +33 (0)1 45 89 69 48) Metro Corvisart (Line 6), Tolbiac (Line 7), a typical working-class French restaurant. Be forewarned: the food is excellent but the service can be a bit abrupt. Thirsty? Fill up your canteen with water from an artesian well, located at the Place Paul Verlaine, right around the corner from Le Temps des Cerises on the rue Bobillot. Join the many Parisians who regularly draw their drinking water from this well. b. 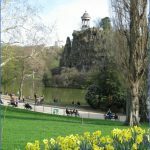 Another hill area is Les Buttes Chaumont, located in the 19th arrondissement. Like the Butte aux Cailles, it has been written up in most tour guides, but somehow people are loath to leave central Paris and wander farther afield. 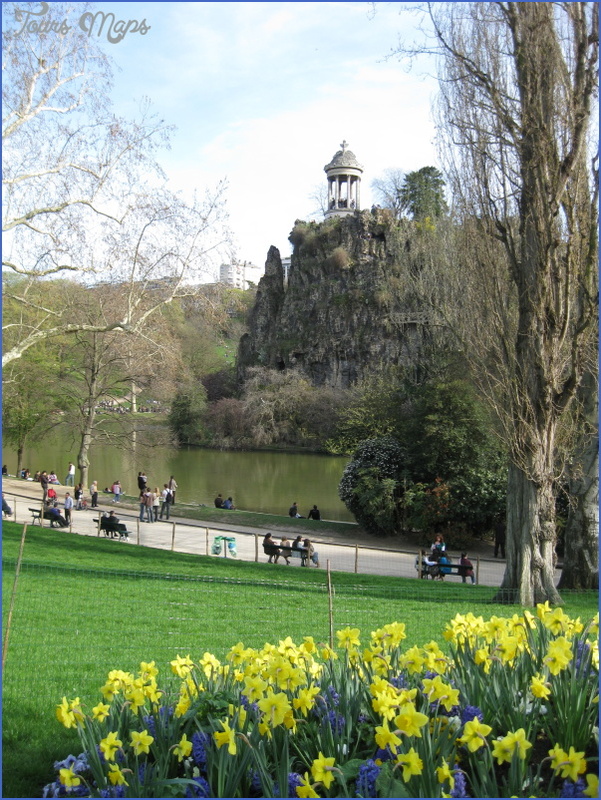 The large and magnificent Parc des Buttes Chaumont is worth a visit. A real treat in that area (Metro stops Botzaris or Danube, Line 7bis) is an area called the Quartier de l’Amerique or le Quartier de la Mouzaia. A quick bit of history: like many of the most charming areas in Paris, this was originally a workers neighborhood, the site of gypsum quarries. According to a nice but apparently unfounded legend, the gypsum from this area was used to build the White House, hence the name Quartier de l’Amerique. In any event, the workers have long since gone, but the charming houses have remained. The rue de la Mouzaia is a kind of backbone running through the area: on either side there are narrow pedestrian streets called Villas with one gorgeous little house after another, surrounded by beautiful gardens and foliage. You will have the feeling that you are walking in the French countryside. c. But I have saved the best for last. If you take only one breather from shopping and the museum districts, then I urge you to take a trip to la Butte Bergeyre. 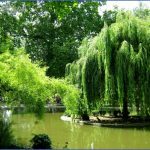 It is located near the Parc des Buttes Chaumont. While it is part of the same geological ensemble, it is the only one of the hills in that area that remains residential. French Communist party. Several years ago Prada rented the premises for their seasonal runway show. But let’s not get side tracked! Walk up the avenue Mathurin Moreau and take a right onto the rue Georges Lardennois. Climb the 86 steps and voila, 100 meters higher, you have arrived. Silence broken by the singing of birds, paved streets, vineyards, a shared garden and the most fabulous view of Sacre Coeur. This is light years away from the hustle and bustle on the streets below and in the nearby Belleville neighborhood. Originally a gypsum quarry, then inaugurated as a sports stadium in 1918, the Butte Bergeyre was named after Roland Bergeyre, a twenty-year old rugby player who was killed at the start of World War I. The stadium was in turn demolished in 1926 to make way for new housing to be built. Today there are just five cobblestone streets, no cafes, no shops, just beautiful houses and an incredible peaceful atmosphere. So just stroll and enjoy the experience.